Hi again! First of all, I want to thank you guys for such an overwhelming response on my first blog post. You guys are AWESOME! 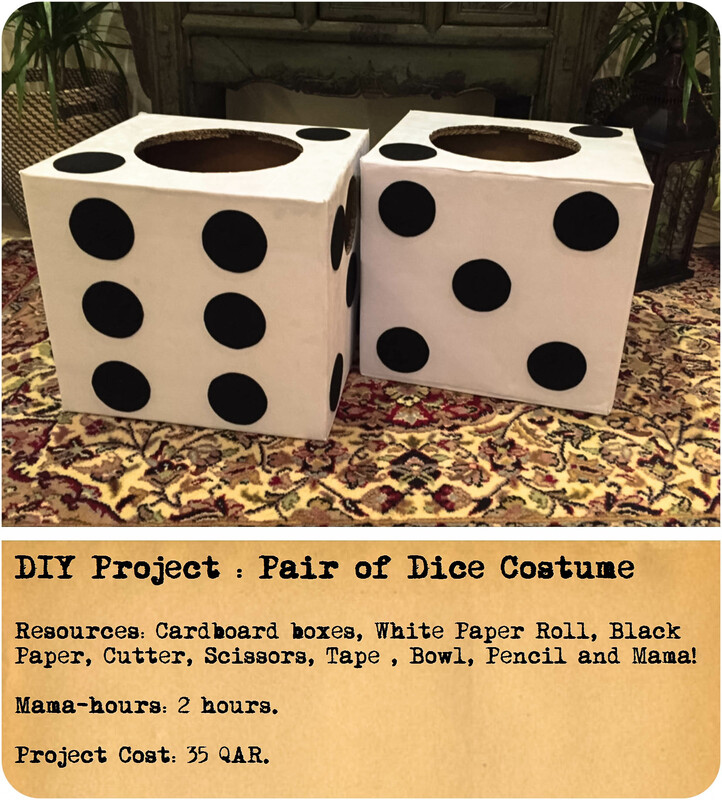 So, here I am again, but this time with a DIY Project that I did for Violet and Dash’s Math Day at School. Yep you are right , I made them into a “Pair of Dice”. Most of the mums dread these dress up days at school. I have a friend whose kid has asked to be dressed up in the same costume for the last 4 years!!! (Are u also wondering, what would it be like to have an awesome kid like hers?! – Dream On Mums!!! They are a rare specie ). As for me, I get really excited at any opportunity to do something creative (please please don’t hate me working/busy mums.. I really get bored of the same routine!). Anyways, so this time the costume I made was really simple and easy. Here is a simple step by step tutorial of how I did it. I got two square cartons (finding square ones was a challenge) from a local super market. I asked the guy at the checkout register, if I can get two empty boxes and he was kind enough to show me the warehouse where all the empty boxes were kept! I looked and searched for what I wanted for FREE! While looking for plain white and black paper at a local craft store, I stumbled on this amazing roll of Self Adhesive Velvety White Paper. I didn’t think twice and picked it up (Cost 25 QAR). I also found small sheets of Black Paper in the same material (Cost 10 QAR). BINGO!! 3. Now the actual work, I cut off the flaps of the open end of the boxes, and covered it in the lovely white velvet. 4. Next I took a bowl (DONOT judge my bowl – its one of the first few pieces of kitchen utensils my husband had before we got married.. sentimental value :P) to mark the circle at the base of the box for the head to go in. 5.Next, I marked two smaller circles (I was too lazy to get up and go again in the kitchen to find another bowl) using the ‘outer circle’ of the tape I had. I then used my cutter to cut these circles out. Simple so far?? 6. Next on the back of the Black sheets, I used the ‘inner circle’ of the tape to draw smaller circles. (Yes Yes, I know.. I am crafty and all … BUT I am lazy and I know it 😛). I cut them off with the scissors carefully and peeled the sticker and pasted them on each side. TADDAAAA!!!!! 7. 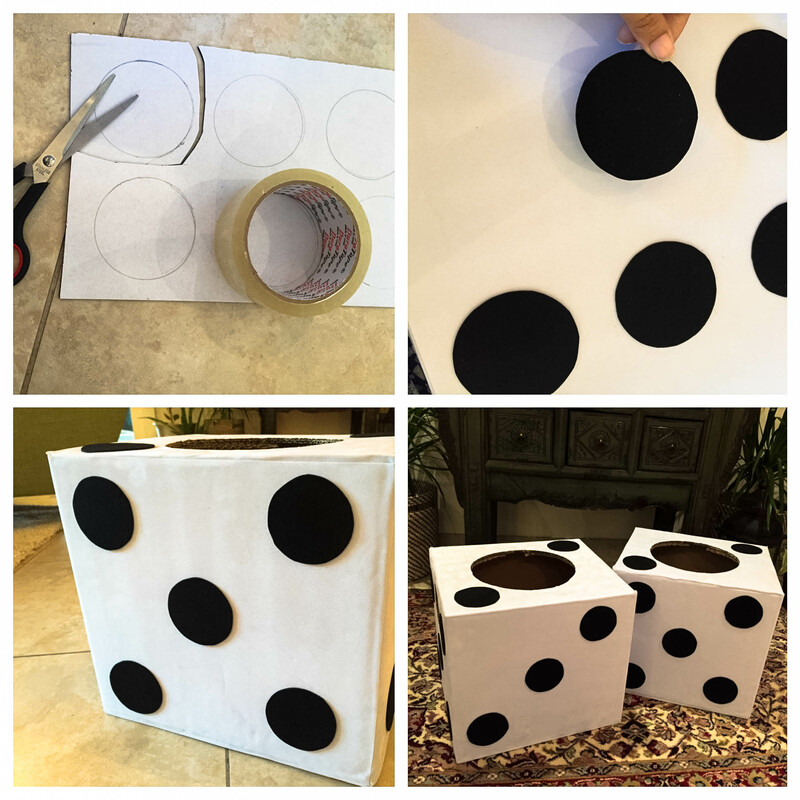 Repeat steps 3-6 for the second dice! Try it at home.. its Fun and Super Easy! 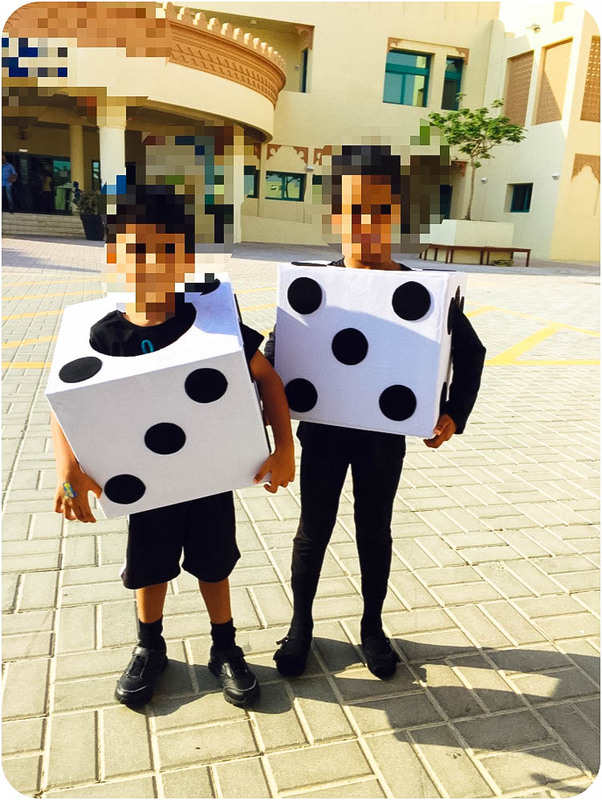 The kids had an awesome time at school with their costumes. I had to make 3 of them, otherwise ‘Jack Jack’ would have turned the house upside down! “WHERE IS MINE!!??”. So I made one for him too. Since the kids have come back from school, my three monkeys have been playing with these! I think the excitement is gonna last for atleast this weekend! (good for me and my husband- as they have a new ‘toy’ to play with). Though,I am not sure about life of Jack Jack’s dice, as after 10 minutes of playing with the dice, he sat on it and SQUISHHHHHHHed it! 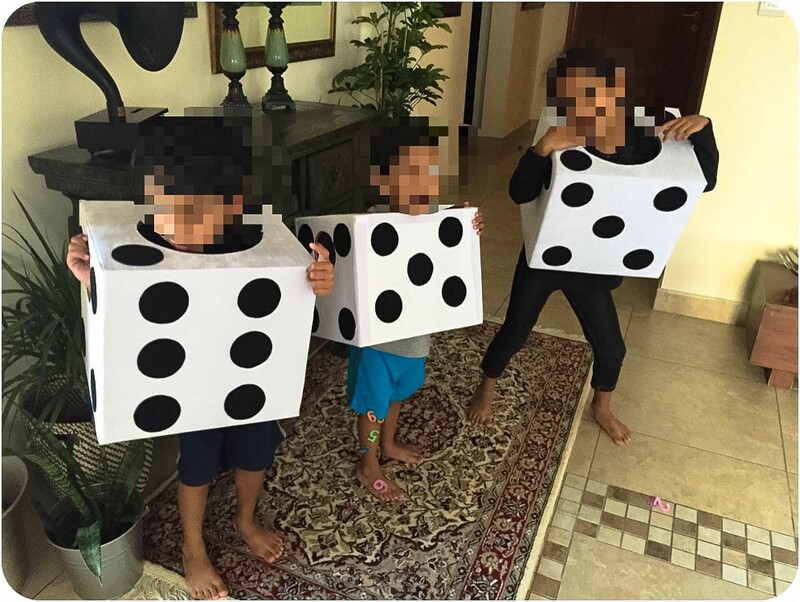 My Monkeys – play time after school! Hope you enjoyed the tutorial. Till next time…. Karachi Se Doha – A (not so quick ) glance at my life..
Its just amazing how you manage to do all such creative projects with so much enthusiasm 😄 i felt tired just by reading the process only 😜 well done 👍🏼 and I love how you write all the details!